Rajkummar Rao and Kangana Ranaut goes extraordinarily insane in the new poster of their upcoming film 'Mental Hai Kya'. Sharing the new poster, makers have also announced the new release date of the film,which will now arrive in cinemas with Shahid- Kiara's 'Kabir Singh' on 21st June. 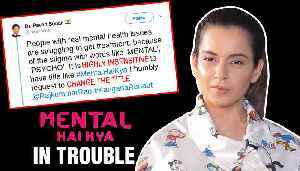 ‘Mental Hai Kya’: Kangana Ranaut’s sister Rangoli Chandel gives clarification regarding the controversy of her sister's upcoming film "Mental Hai Kya" Watch the video to know what actually.. The film industry must exercise caution and be more sensitive in its messaging, irate psychiatrists have said in reference to the title and posters of the upcoming Hindi film "Mental Hai Kya?",.. Kangana Ranaut’s film Mental Hai Kya lands in trouble due to its title. The makers are receiving flak from mental health experts. Watch the video to know more details about the controversy. #Kalank Box Office collection, Kangana Ranaut's new film Mental Hai Kya in trouble, #SalmanKhan shares 5th poster released are among the Top 10 News in Bollywood Now's Daily Wrap. Kangana REACTS, If ‘Manikarnika’ doesn’t win any National Award ! Actress Kangana Ranaut, who was last seen in "Manikarnika - The Queen of Jhansi", says that if she will not receive a National film Award for her portrayal of Rani Lakshmibai in the historical drama,..